So as mentioned, this is my part of Laeleiweyn’s Alt Appreciation topic. That is my mage as she looked during Wrath in the header image. I really miss the poseable armory. It allowed me to get all kinds of fun pictures of my kids. This is a recreation of my mage when she was human. My adventures with my mage started in Wrath. 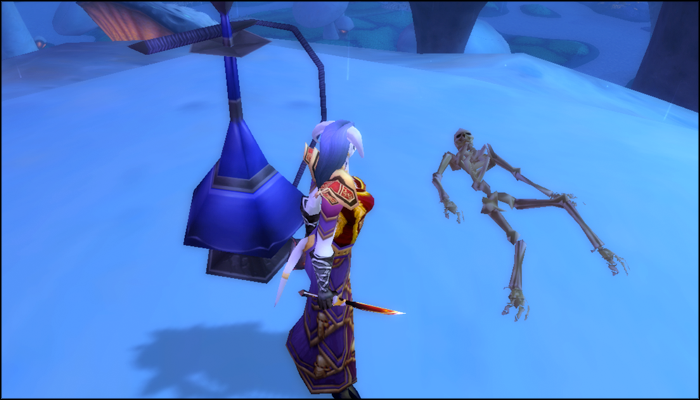 Mage is not a class that makes much sense to me and my mage’s identity–or lack thereof–reflects this. She was originally a human with red hair. I named her Daphnye after Daphne from Scooby Doo because I figured she would always be a damsel in distress. I also have (dyed) red hair and blue eyes so she was the closest in character type to me–which was probably a mistake. I even wear my hair like that most days. I was very bad at mageing. I died constantly and found it a very frustrating class to play. There are murlocs in Elwyn forest that chain killed me so many times. It was a battle to reach level ten and by that point I was willing to give up. So Daphnye sat in Stormwind for about a year. During this time I hit level eighty on my deathknight and my paladin. Both of them played Wrath endgame which included Wintergrasp. Eventually all that led to me buying cloth heirlooms. I decided I would pick up my mage again after making a needed change. This is on top of a mushroom in Zangermarsh. I always wondered if it was Alice. I changed Daphnye into a draenei because I don’t really like playing humans that much. The way they run is weird to me. I do love my draenei though. As you can see from the above picture, this was taken at about the same time as the armory screencap. Daphnye was my third level eighty character. I eventually got better at playing a mage, but I never felt competent. 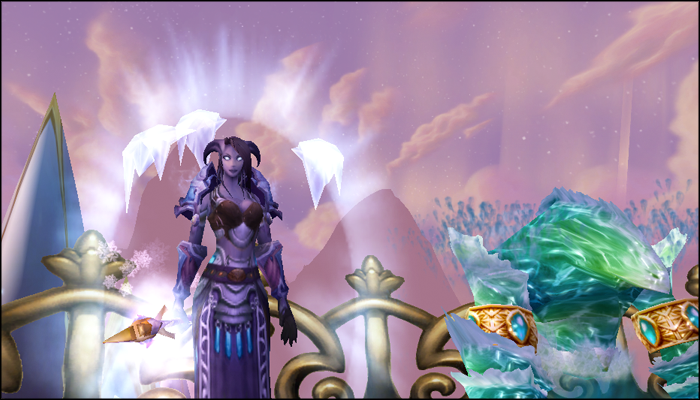 She has mostly always been a frost mage even though in Wrath a frost mage was not welcome in PVE. Somehow Daphnye ended up being my first character to kill Yogg-Saron. Ulduar was easier for me as ranged. With Cataclysm I had more troubles with my characters than I had in Wrath. The mobs in Hyjal and Vash’Jir were really tough if you were going in without raid gear. Daphnye was not in raid gear. I think she had some mishmash of mostly ilevel 200 gear. This is Daphnye late in Cataclysm. This was her second time as a draenei; she got a tan this time around. I decided to try making her a human again because at this time all my characters were draenei. 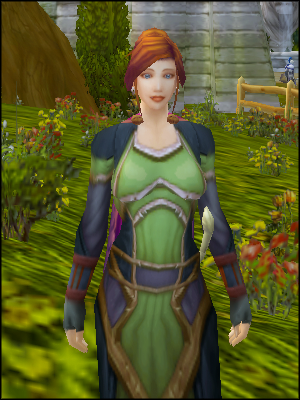 So Daphnye spent a brief second stint as a red haired human mage. I think that lasted until she was level eighty-four or so. I still didn’t like playing a human so I went back and changed her again. Daphnye became a draenei for the second time with different coloring. She made it to level eighty-five and was pretty much parked for most of the expansion. I did the Firelands dailies on her to get bag recipes but that was it. Interesting tidbit: I got ultimate triage on her while doing the intro quest to those dailies. That first elite elemental got very close to killing her. Yay for bandage spec heals. Daphnye is now Meilinn. She doesn’t even try to explain her identity nowadays. 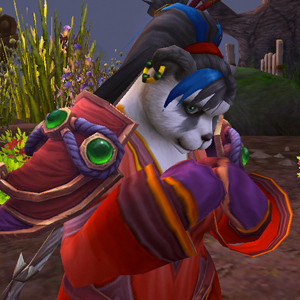 Mists became a reality and I decided that what I really needed was more Pandaren characters. I bet you can guess who was first up for a race change. Daphnye became Meilinn and so far I really enjoy her being a Pandaren. She is level eighty-six and spends most her time hanging out in Halfhill. From there it is a short run to the Silken Fields and she can also farm small amounts. Mei is plotting about how to make me play her more often. I still don’t play a mage very well. Sometimes she gets really close to dying just from the critters on the farm. I haven’t really tried to level her though. I suspect if I sat down and focused on her class I would pick it up. My main goal for her this expansion is just to get to ninety. I don’t know if I will do anything with her after that. Meilinn is my tailor and now she is an enchanter too. Eventually I want to get all the recipes. As you can probably tell from the many faces of my mage, I don’t know who she wants to be yet. I think Pandaren might stick. If it doesn’t she will probably go back to being a draenei. 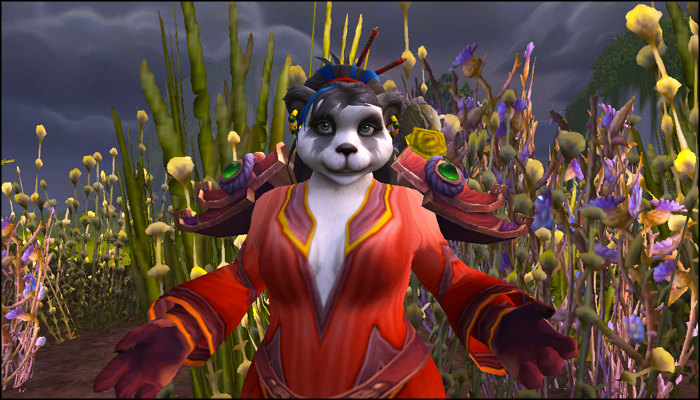 I love her face as a Pandaren though. Mages are fun for me even though I am bad at playing them. I have some baby ones on different servers. If any of them start to get leveled past ten I’ll add them in one day. About the healing mages; I did an effort with my mage after she hit 90 to get the Overgrown Lilypad from the jinyu rare in Valley of Four Winds. The item gives you the symbiosis-effect, which for mages is a heal! xD I think some of my problem with the mages is their extreme squishyness (in my hands at least). Now she can heal herself a bit at least. 🙂 AND I actually managed to kill that rare, so she can’t be all that bad!